And yet, six decades later, Sales still takes precedence because it is responsible for a company’s top line revenues. It’s only in the past couple of decades¾with the advent of the World Wide Web, social media, Customer Relationship Management (CRM) systems, marketing automation platforms (MAP) and a prolific demand for purposeful content¾that Marketing is finally getting its “revenue” due. In marketing-driven companies, as Drucker always wanted them all to be, the Chief Marketing Officer is gradually being recognized as an integral part of the corporate Revenue Performance Management (RPM) team. A social Enterprise is one that supports Mobile, Customer-centric, Cyber-secure, Cloud-based, Communications, Collaboration & Content. 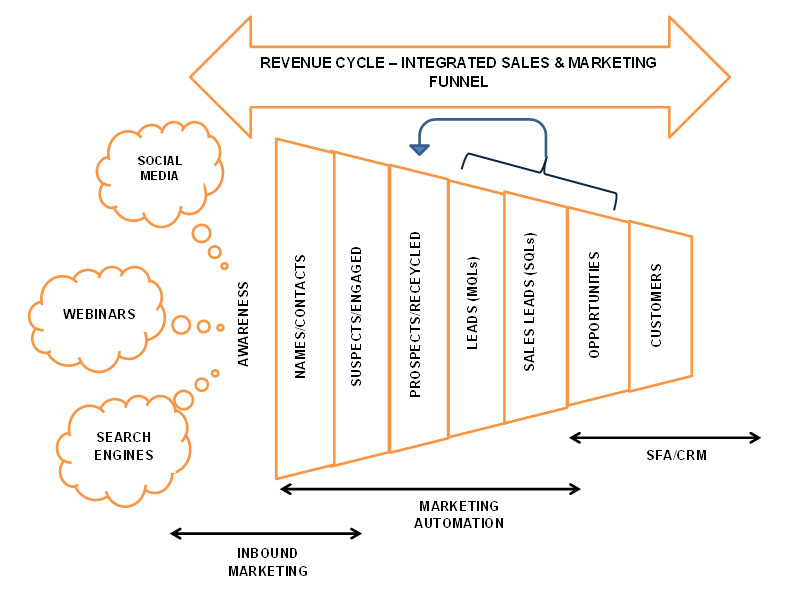 Marketing drives business development strategy; Sales executes it to generate revenue. Thanks to the Internet, search engines embedded with sophisticated algorithms, CRM-integrated MAP platforms, and social media applications supplemented with monitoring tools, Marketing now possesses reasonably accurate scientific means to generate and maintain an ongoing awareness of a company’s value proposition. The corporate RPM team uses this awareness to generate a business development strategy that Sales executes to generate revenue. Marketing generates leads; Sales closes deals. The old-line method of telemarketing is slowly dying on the landline vine and the traditional Sales cold call is losing its efficacy as The Marketing Id had anticipated almost four years ago in, “Hello Sales, the Cold Call Just Got Warmer!” Thanks to MAP and inbound analytics, Marketing can generate more hot leads and in a more efficient manner than cold calls ever did. Sales can thus focus on closing real deals and delivering more predictability to a company’s revenue stream. Marketing provides competitive intelligence; Sales uses it to outsmart the competition. Competitive intelligence is no longer either the sole or the reliable domain of professional analysts and their magic quadrants, which while useful at a strategic level are not granular enough to impact a company’s tactical revenue generating decisions. Again, thanks to the increasing power of search engines, social listening and Big Data analytics, Marketing can closely monitor the competitive landscape and hone in on prospects with much better accuracy than ever before. The closer the Marketing Qualified Leads to Sales Qualified Leads ratio is to one, the better Marketing is doing its job in analyzing the competition and qualifying prospects. Sales then needs to use its innate selling skills to outsmart the competition. Marketing owns the product ecosystem; Sales owns the customer base. More importantly, while Marketing has gained a more customer-friendly hold on the product ecosystem, Sales has also seen a commensurate benefit because it is able to use this customer-driven product lifecycle to more effectively manage not only its customers, but also its prospects. Deal making, while still an art, has thus become more predictable. Marketing owns the content ecosystem; Sales disseminates content per requirements of RPM lifecycle. In the new marketing paradigm, the cliché “content is king” is being superseded by the reality that content marketing is ace! Marketing owns the content ecosystem for sure, but barely four months ago, The Marketing Id had discussed “Overcoming Content Marketing’s Two Biggest Challenges.” If Sales too needs to be “targeting the right content in the right amounts to the right audiences at the right times” – Marketing simply has to find the time to create this content as required. Finally, the good news from the Internet and social media revolutions has been the evolution of a tighter relationship between Sales and Marketing. While the former remains a very sophisticated art, the latter continues to evolve into a more exacting science. Together the synergies between Sales and Marketing are breathing new life into the revenue generating abilities of the business enterprise.